Develop your brand of baseball and life. Insist on yourself; never imitate. A WORLD-CLASS COACHING CURRICULUM THAT EMPOWERS PLAYERS TO MAKE CHOICES THAT STRENGTHEN THEIR LIVES. NextStep Baseball empowers you to define who you are, what you want, and what price you’re willing to pay to actually be that. What would happen if you were intentionally 1% better every day in every way? Your 1% advantage lies within the controllable and manageable now. It’s a proactive focus on incremental gains. It’s a marginal decrease in the slump and a slight increase in the streak. It’s sustainable brilliance in the basics—not just in the way you play, but in the way you live. NextStep Baseball positions you to compete, to trust deeply in your ability, to be resilient, and to do it 1% better today than you did yesterday. Improving by just 1% isn’t notable at first (sometimes it isn’t even noticeable), but this slight refinement in judgment, self-awareness, and routine can make all the difference long-term. Committing to your 1% is having the courage to separate from the pack and having the confidence to be different, to be faithful, to prove yourself right. NextStep Baseball empowers players to make choices that strengthen their lives. The NextStep Baseball curriculum is a management system to control emotional intelligence in life and sport—fear, excitement, and confidence specifically. Our dedication to intentional planning and thoughtful preparation ensures that we deliver a product worthy of your time, investment, and trust. We are committed to offering a simple, universally applicable model for channeling and focusing human potential. We understand the importance and value world-class baseball organizations place on cultivating championship caliber players and people. At NextStep, we are not merely determined to help players advance to the Major Leagues; we are fully invested in equipping players and staff with the tools necessary to unlock their potential to be lifelong Major League leaders on and off the field. We believe in professionalism. We value each player’s respective development and partner with players and organizations to present strategies that will help you purposefully manage your unique talent and ability. Together, we approach each player as a prospect until proven otherwise. We provide a methodology to help prospects and organizational players reach their greatest potential though efficient decision-making, problem solving, and focus realignment. When we deliver our winning framework for strategic coaching, you are empowered to create a constructive environment for baseball development and accelerate the overall advancement of you and your entire clubhouse. I am a catalyst for personal and professional discovery, growth, and development. I see possibility everywhere and challenge the notion of limitation. Passionate, intentional, and personable I strive for impact and drive winning results in business and life. My promise is to set a good example for each person with whom I have contact. My example is one of integrity, honesty, and sincerity. I treat others with kindness, compassion, and patience. Through my actions, others are encouraged to seek excellence, persevere, like who they are, and have faith in their own abilities. I do my best in everything I undertake. I define the price it takes to be successful and I willingly pay that price. I have written goals in every area of my life. My goals are challenging, motivating, and realistic. When I face obstacles in reaching a specific goal, I do not change my goal; I change my direction to get there. My actions reflect the love I feel and the long-term goals I have. I am proud of my thoughts, words, and deeds as they mirror my belief in God and my respect for truth, optimism, and determination. I serve others and add value to their lives in any way I can. I am empathetic and supportive while helping my peers identify their own solutions. I stimulate others toward change and growth through my curriculum, mentorship, and trusting friendship. Leslie Herrmann has worked six years in baseball at the Collegiate, Minor, and Major League levels. 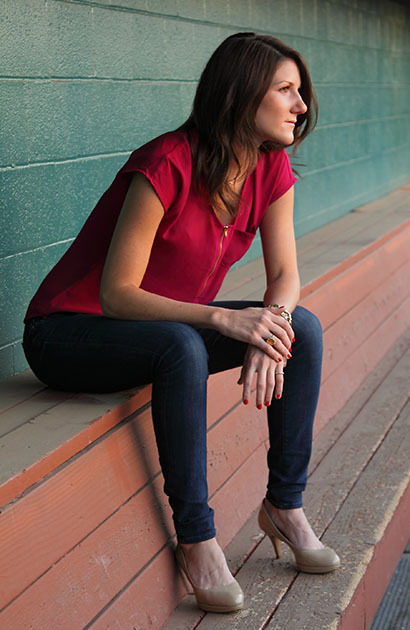 Prior to founding NextStep Baseball, she graduated from Holy Cross in Worcester, MA and interned at the MLB Office of the Commissioner in New York and in Baseball Operations for the Arizona Diamondbacks. Mentored by several current Major League coaches, front office executives, and former Major League players, Leslie is harnessing a dream and following a path similar to the players she partners with. She began her career as an intern with the Modesto Nuts, Class A Affiliate of the Colorado Rockies and went on to spend two more seasons in the Minor Leagues working for the New York Penn League. During her tenure with the Lowell Spinners, Boston Red Sox Affiliate, she was awarded as the 2011 Minor League Baseball NYPL Executive of the Year. Having served four years as the student manager of her Collegiate Division I baseball program at Holy Cross, she believes in raw talent and argues every player is a prospect until proven otherwise. She says youth and possibility drive her venture. A student of the game, but first and foremost a student of personal self-awareness and productivity, her passion in baseball and life is personal and player development. Leslie does not, “do it for the story,” she actively participates in writing the story. She plays to win. Fluent in English, Spanish, and “Dugout,” Leslie is tri-lingual. We play to win and we have fun along the way. We’re experts at what we do and we partner best with results-oriented players, coaches, and executives who aspire to be experts on their own turf too. Our pricing is closely aligned with the caliber of our product and the elite players we serve. Our partnership is one of equal investment and our deliverables are customized to you.